There has been little doubt that recent years in China have been associated with an astounding rate of economic growth. Naturally, there has been, and will continue to be, an increase in the number of motorists on the roads as China continues to grow. Perhaps one of the first things any individual accustomed to life in a Western culture will notice upon arrival into China is the incredibly consistent use of car horns on the streets. In fact, it has been suggested that the car horn is used, on average, about 40 times more often in China than in Europe. But the question here is whether this seemingly ridiculous use of the horn should be considered to simply be angry, rude noise, or whether it actually holds a deeper meaning. Coming from a Western society where the car horn is used rather conservatively and usually only in situations of emergency or as a polite reminder to the vehicle in front it may be easy to perceive the use of horns in China to be rude and unnecessary. This is understandable as in Western cultures the horn is generally associated with road rage and impatience. However, it seems that horn honking in China is not just noise at all, but in fact serves, in many cases, as a sort of medium of communication between drivers and pedestrians. It can actually be rather useful for a foreigner to try to learn and understand the culture behind the seemingly incessant horn honking as it may very well assist them to avoid accidents on the road. 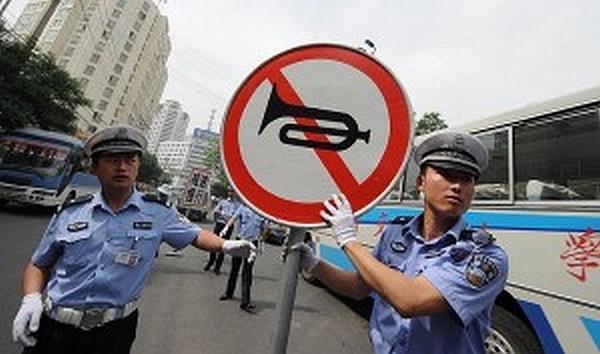 Various types of honks may be heard on the streets of China and often each one carries a specific type of message. For example, a short honk can often be used by taxis to indicate to potential passengers of their presence, whereas other short combinations of honks may be to warn pedestrians of the presence of a quickly approaching vehicle. Of course, the prolonged, ear-piercing honk can usually be perceived as a rather angry and impatient gesture to try to get the vehicle in front to either get going or move out of the way. Nevertheless, it is indeed interesting to note that generally everybody in China understands and accepts their culture of honking and is part of their everyday life. Curiously, the honking dialect extends not only to the length and pattern utilized, but also to the tone of the honk itself. This can be observed as it seems that people in the Middle Kingdom tend to be rather particular with the type of horn that their cars come with. Evidence of this phenomenon can be seen from cars produced by car makers such as Peugeot and Ford who have both adapted their car horns to adapt to the tastes of the Chinese people. In fact, cars don’t tend to sell as well if they do not have the appropriate horn suiting the culture of honking on the roads. Of course it is no surprise that in certain areas of China horn honking has posed a threat of noise pollution to the city. As a result, certain “No Honking” zones have been set up in an attempt to reduce this noise pollution. Areas such as Shanghai have implemented this by posting up no honking signs and threatening to issue fines for those who do so in these areas. For someone arriving in China for the first time it may be quite the culture shock to hear such a crazy amount of horn honking, but rather than to dismiss it all as noise, it may very well be beneficial to learn at least some of the meanings behind the various tones and patterns of this strange language. This post was originally published on the UNNC School of Contemporary Chinese Studies blog.